How much does a Royal Wedding in Udaipur Cost? DESTINATION WEDDING FOCUS: HOW MUCH WOULD IT COST TO GET MARRIED IN UDAIPUR? As an Indian wedding blog, we love to feature and promote lovely Indian wedding destinations. And Udaipur is our absolute favorite!!! Udaipur, the land of kings and queens, majestic forts and royal palaces, picturesque lakes and gleaming sand dunes, is one of the most luxurious and desired wedding destinations in India. As destination wedding planners we often get asked about the costs associated with planning a destination wedding and how much would it cost to get married at in Udaipur. While in general, wedding costs vary on a case to case basis, we have collated a list of some of the most important cost factors when planning a regal wedding in this historical land. Hope this helps you in budgeting your own Palace or Fort dream wedding in Udaipur! Let us assume you are planning a wedding for 100 guests for 2 nights. Depending on the type of hotel you choose, it can start from Rs 15 lakhs for smaller wedding venues like Chunda Palace and Ramada Udaipur and go up to Rs 60 lakhs upwards for venues like Jagmandir, Taj Lake Palace, Leela Udaipur and Oberoi Udaivilas. The magic of Udaipur is seen in its rich heritage, vibrant and vivacious markets, delicious Rajasthani cuisine, gracious hospitality, traditional dance and folklore, wildlife safaris and abundant natural beauty. It’s royal grandeur, regal romance and opulence is what makes it a wedding destination like no other. If you want to feel no less than royalty on your most special day, then Udaipur is your dream wedding destination! Udaipur is the city of lakes, and has some of the most amazing wedding venues in India (or for that matter, anywhere in the world!). While Jaipur has many hotels to choose from; Udaipur has fewer wedding worthy choices in comparison. Udaipur has around 15 extravagant heritage venues to choose from, most of them surrounding Lake Pichola. The most popular and expensive wedding venues in Udaipur are Jagmandir Island Palace, Taj Lake Palace and City Palace. These venues charge anywhere between Rs 8000-10000 per person (includes food, travel by jetty, basic decor). Jagmandir does not have guest rooms to accommodate wedding guests. Guests stay at nearby hotels as most of the hotels are in close proximity to one another. Taj Group of Hotels, HRH Group of Hotels, Oberoi Group, Leela Kempinski, Starwood Group of Hotels and Lebua Group of Hotels are some of the dominant hotel chains in this area. Once you’ve decided on the location, accommodation will depend on the size of your guest list and personal preferences. Many a times, couples accommodate guests at hotels near the wedding venue instead of the venue itself. The wedding venue and accommodation make around 60% of the cost. 5 star Deluxe Heritage hotels like Leela Palace and Oberoi Udaivilas in Udaipur cost anywhere between Rs 20000- Rs 40000 per night depending on the season. Trident Udaipur is a luxury 5 star hotel that is less expensive and costs Rs 8000 per night on an average. 5 star hotels like Lalit Laxmi Vilas Palace and Chunda Palace are priced at Rs 7000-Rs 9000 per night. 4 star hotels in Udaipur like Sheraton Palace Udaipur and Ramada Udaipur are much more reasonable and cost anywhere between Rs 5000-Rs 8000 per night. 3 star hotels, unconventional accommodation like haveli style hotels and generation-old homes converted to hotels are much less expensive and there are quite a few options to choose from. NOTE: Recently built hotels like Lalit Laxmi Vilas, Trident and Sheraton have a large inventory of rooms as compared to heritage hotels. Most hotels and resorts in Udaipur do not charge separate rentals for the venue. However, some prime wedding venues (in 5 stars like Leela Palace) cost Rs 50000- Rs 300000 for wedding lawns and courtyards. Many of the prime venues like Jagmandir and Taj Lake palace have a per person wedding package that includes food, welcoming guests, a boat ride on the gondola and standard decoration. These packages cost anywhere between Rs 8000- Rs 12000 per person and are not seasonal. NOTE THAT THESE VENUES DO NOT HAVE ROOMS STAY, THE CHARGE IS FOR THE WEDDING EVENING. NOT FOR STAY. Wedding buffets cost anywhere between Rs 2500- Rs 4000 in 5 star deluxe hotels and Rs 800- Rs 3000 in 5 star and 4 star hotels. Wedding decor includes the aisle, mandap, tables chairs and linens, centrepieces, stage, dance floor, lighting, LED and floral arrangements. Most hotels in Rajasthan allow outside decorators as not many venues have decorator monopoly. 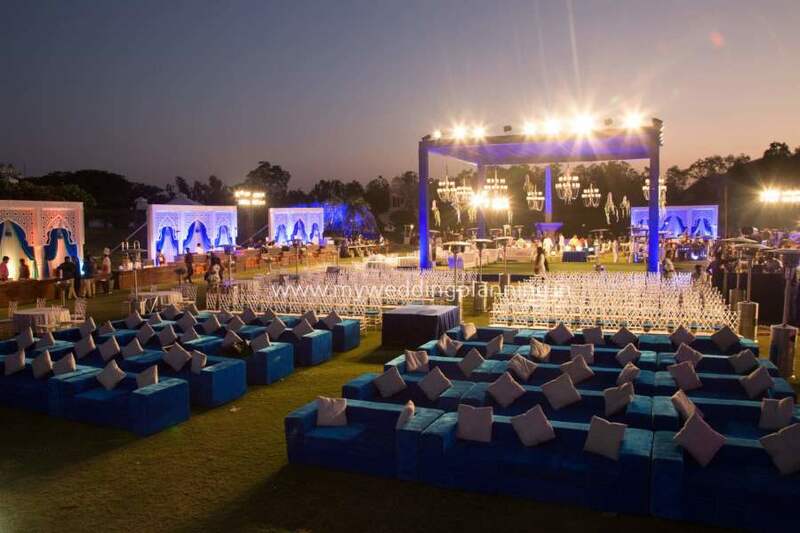 In general wedding decor should cost anywhere between Rs 6,00,000- Rs 15,00,000 for the main day, while Rs 200000-Rs 400000 for pre-function. However if you’re looking for something unique and elaborate, you may incur a cost of Rs 15 lakhs upwards. Travel in Udaipur is moderately priced, and in many cases the guests pay for it themselves. However it is a good gesture to pick up your guests from the airport or train station so as to not inconvenience them. In this case arrange for a bigger car that can accommodate more people or a coach. A mini-bus or coach works out to be a cheaper option and costs around Rs 7000-Rs 9000 a day. A private car costs anywhere between Rs 2000-Rs 3000 a day (8-10 hours). If you opt for a local photographer from Udaipur, it would lead to great savings as famous ‘Destination Wedding’ photographers charge around Rs 5,00,000 to Rs 10,00,000 for covering a 3-5 day event. Plus you will have to factor in their stay and travel costs as well. Local photographers and studios charge around Rs 30000-40000 per day. Make-up and hair artists & Mehendi artists for the bride and the bridal party have to also be included in wedding costs. If you go for a local beautician, there are quite a few good options to choose from, but make time for a trial session before the wedding day. A good makeup and hair artists cost Rs 6000-Rs 22000 for wedding makeup. Try to get a package deal for all the days with a much better all-inclusive rate. Else you can take your trusted makeup artist along to Udaipur and arrange for food & stay. Couples these days have theme weddings like Arabian nights where they rope in belly dancers or a Gatsby theme with Russian dancers or a Casino night or Bollywood night for their guests. Be ready to pay anywhere between Rs 15000-Rs 300000 for entertainment. If you opt for big names and well known celebrities then your costs will go up accordingly. Fireworks, elephant or horses for the procession, special crockery and cutlery, wedding plannersand other miscellaneous expenses should also be taken into consideration. Wedding planners might be able to get you some great discounts, so planners like us should not be seen as an additional expense, but a cost saving tactic!!! 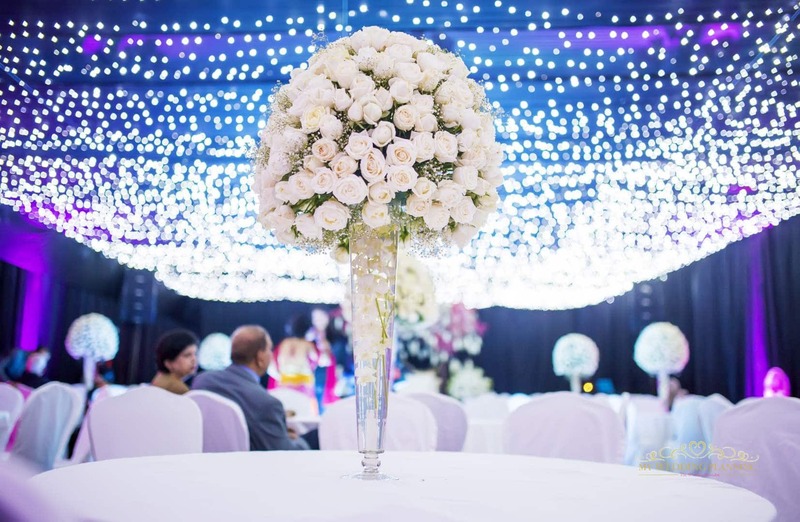 At My Wedding Planning, we have some cost-effective and amazing wedding theme decor packages catering to all budgets. Make sure you have a look at our impressive catalog, before finalising your wedding decor! For more information about weddings in Udaipur, we are here to help. Ask us anything!